Disaster can take place at any time, anywhere. 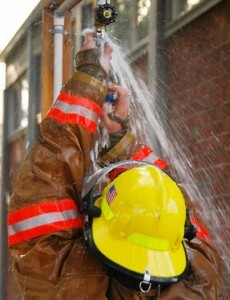 Water pipe breaks and fire-sprinkler line leaks generally occur throughout the warm spring days and cold winter season. The temperature level change and the age of the pipe play crucial roles when pipes break. As water gets frozen, it expands, putting substantial pressure on the inner walls of the pipeline material. Sooner or later, the structural stability of the pipes will certainly deteriorate and will cause plumbing to burst. No homeowner wants to find a pipes break inside their kitchen area or bathroom. 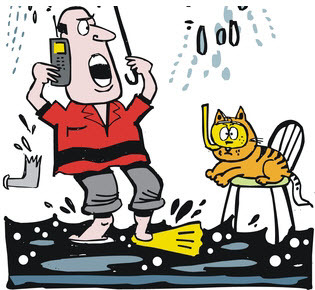 Yet, AllStates Restoration water damage specialists prepare when you’re faced with water damage to your house. 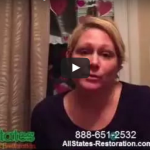 Our expert crew at AllStates Restoration suggest leaving a drip of water flowing through house taps during the cold winter season. Businesses, schools, and other commercial properties depend on fire-sprinkler water pipes to put out fires but could experience major flooding when fire-sprinkler water lines burst. 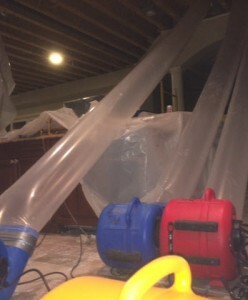 The high pressure of these water lines can cause enormous water damage even if the water just runs for several minutes. AllStates Restoration’s rapid response for water removal and flood damage repairs will fix any flooding in your business or commercial building. Our accredited restoration technicians will remove all the wetness from your flooded carpet or hard-surface floors, walls and ceilings using our customized drying equipment and will get you back to business before you know it. Leaks or massive breakdown from a “wet pipes” fire-sprinkler system may trigger catastrophic harm to your home or work place. Leaks present in your fire sprinkler structure could likewise suggest corrosive damage or other sub-optimal efficiency aspects that could considerably reduce effectiveness throughout a property fire. A little leak presently can result in huge head aches tomorrow. 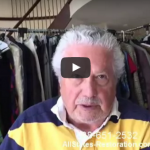 Call AllStates Restoration to have your water damage from leaking fire-sprinkler checked and returned to pre-loss condition. We’re readily available to consult with your insurance. Among the most common requests we get about fire sprinklers is about their prospective to damage a structure. Such issues are not unfounded it is simply that water damage can build up after a fire sprinkler goes off. Yet, the level of defense afforded by fire sprinklers more than mitigates the prospective risks. Even so, there are always people who are concerned that a fire sprinkler head error or system breakdown, typically referred to as unintended leakage or discharge, will trigger their fire sprinkler to go off and cause major damage to their building and the equipment inside it. As it turns out, the rate of accidental discharge for fire sprinkler systems is very uncommon the American Fire Sprinkler Association (AFSA) approximates that the rate of fire-sprinkler failure not straight caused by man mistake has to do with 1 in 16 million. For contrast, the chances of you being struck by lightning are just 1 in 1 million! General leak in your fire sprinkler system are no more likely to occur than they are in your plumbing pipes, and in the not likely occasion that one does happen, it’s usually in an older fire sprinkler system that has not been appropriately maintained. Fire sprinkler heads are turned on by heat/Overheating, going off when the temperature in a specific location will get too high. When installing a fire-sprinkler, make sure you consider the hottest your room can get, even during the summer high temperature. Different fire-sprinkler heads are designed to go off at various temperature levels, so if your ceiling temperature gets to 155 F, you’ll certainly want to set up a 200 F fire sprinkler head, and so on. Freezing — in the precise opposite scenario, the water in fire-sprinklers can freeze if proper preventative measures, consisting of adding antifreeze and insulating the pipes, are not taken into consideration. Freezing water may trigger pipes to expand, fracture, and burst, and then leak when the system defrosts out. Typical solutions to this issue include adding antifreeze solutions to the pipelines, adding insulation all around the system, or installing dry fire-sprinklers that leverage air pressure and specifically created valves to keep water out of the system until eventually required. Corrosion pipes and sprinklers, like any water based sprinklers system, fire sprinkler pipes are subject to rust that can impact the functionality of the sprinkler system and possibly lead to leakages. Annual fire sprinkler system evaluation need to keep you protected by this. Improperly installed and kept fire sprinkler systems are at risk of hardware damage, which may be triggered by over-tightening fittings, not appropriately installing sprinkler heads, and a variety of other setup errors. Hiring a knowledgeable fire sprinkler installation contractor, will certainly minimize the possibility of these mistakes to virtually nothing. When you want to all but eliminate the danger of fire sprinkler malfunctions, call expert for a fire sprinkler examination! Is a water damage coused by frozen pipe leaking or break covered by insurance? Typically, damage inside your home and caused by damaged pipes is covered by your home owner insurance policy. On the other hand, if a water main breaks outside your house and then damages the interior might not be covered by your insurance company. AllStates Restoration recommends you browse your insurance policy and talk with your insurance rep to clarify these situations. Fast action on water leak locations can considerably minimize the amount of water damage that your property incurs. We will have an easier time conserving and recovering parts of your property or commercial structure, which equates into lower expenses for you. Call us today and get your place back to its pre flooding conditions very fast! 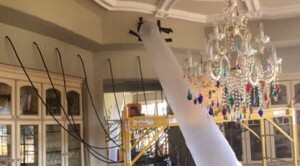 Water damage from frozen pipe leaking in NJ, NY CT or PA. Property loss can quickly take place when water pipes freeze and break, triggering water damage to walls, ceilings, floors, furniture and other belongings. Even a small crack in your pipes can leakage adequate water to flood your property. In fact, in simply one day, 250 gallons of water can be discharged from a pipeline crack as small as 1/8 inch. 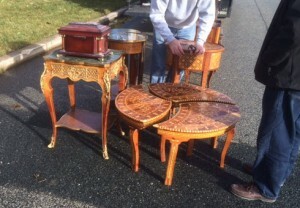 So, it is important to be proactive and act to protect your property. Open bathroom and kitchen cabinets to enable warmer air to flow into around pipes. Open faucets all through the property to let water to leak and to keep pipes from freezing. When heading out of town, keep thermostat at 55 degrees and ask a trusted next-door neighbor or close friend to watch your home for possible leak. Also, turn off your water and drain water supply lines. Bear in mind that homeowners policy coverage are more suitable to pay your water damage claim if you can reveal that you have actually done your required groundwork and maintained your home in a reasonable manner. To schedule Fire Sprinkler Frozen Pipe Water Removal appointment, call 888-651-2532 or click here.